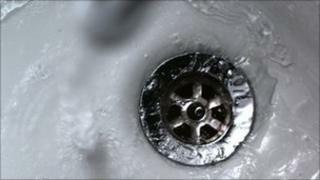 Customer complaints against water companies in England and Wales have fallen for the fifth year in a row, according to the industry watchdog. There were 150,942 written complaints - by letter, fax or email - in the 12 months to the end of March. The Consumer Council for Water (CCWater) said this was a 7.4% drop, less than the previous year's 12% fall. Telephone complaints also fell broadly in line with written complaints. Billing and charges remains the biggest area of concern for customers, accounting for more than 56% of the total written complaints. But the total number of billing complaints fell by 17%. Complaints about sewerage services increased by more than 50% compared with the previous year. The water watchdog said it was concerned that the poorest performing companies still lagged too far behind the rest of the industry on complaint numbers. These include Southern Water, which saw the biggest rise in written complaints - a 77% increase compared with the previous year - while Yorkshire Water saw complaints rise by 26.5%. Tony Smith, chief executive of CCWater, said he was concerned that the rate at which complaints have fallen had slowed, and that the poorest performers remained too far behind the rest of the industry. "CCWater continues to meet regularly with water companies to put pressure on them to prioritise customer service in order to see their complaint levels drop much further," he said. "We also continue to tell the regulator Ofwat that there needs to be stronger penalties for water companies who are failing to satisfy the expectations of their customers." Southern Water's chief customer officer Darren Bentham apologised for letting customers down, saying the figures were unacceptable. "Things are getting better - we have more staff on the phones covering longer hours and we are receiving fewer complaints," Mr Bentham said. The company added that it had received more telephone calls from its customers than it could deal with, which resulted in an increase in written complaints. Meanwhile, Paul Carter, stakeholder engagement advisor at Yorkshire Water, said the main reason for a rise in complaints at his firm had been extreme weather in Yorkshire, which led to an increase in sewers flooding. "We are investing millions of pounds in our network and in the way that we respond to sewer flooding incidents to improve our service," he said. "We are taking action, but as a measure of how far we've come from last year, the latest quarter survey from Ofwat put us top of the league for customer satisfaction, so our changes are clearly starting to have an impact." Wessex Water was the best performing water and sewerage company based on the measure of complaints per 10,000 customers. Portsmouth Water was the best performing water-only company, despite a 29% increase in complaints.